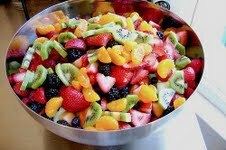 Eating Healthy: Treat my sweet tooth with some fruits! Who says eating right needs to be tasteless? Treat my sweet tooth with some fruits! I have the biggest sweet tooth than anyone out there. I'm sure of it. But I try to live a healthy lifestyle. I have cheat days, but when I don't I endulge into the most delicious fruits, strawberries, kiwis, blackberries, etc. Luckily for me, living in Hawaii, lots of the fruits I buy are home grown and I get to support local farmers also. Miracle Pill to lose weight?